Taken at Knox College, on the University of Toronto campus downtown Toronto, the historic building’s architecture was highlighted alongside the bride and groom. 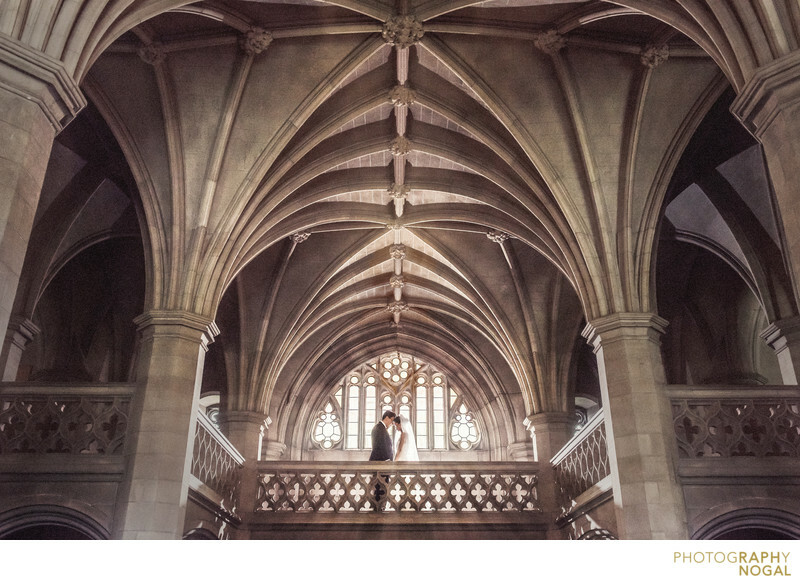 This photo depicts the couple surrounded by the breathtaking vaulted ceilings, stonework, arches, columns and balcony; all combined for a jaw-dropping wedding photo. Knox collage is one of those amazing dramatic locations, full of character and loads of visual drama. This photo was taken with a Nikon D750 DSLR at ISO 2000, f5 aperture, 1/400th shutter speed with a Nikon Nikkor 24-70mm f2.8 zoom lens, at 32mm focal length. The lighting was natural light, backlit from the window behind the couple. Location: 59 St George St, Toronto, ON M5S 3H8.